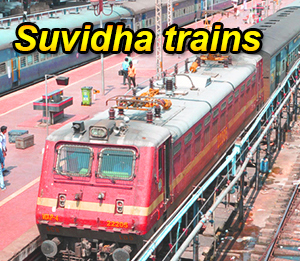 Ministry of Railways had earlier announced to run Suvidha trains replacing the Premium Trains from July 2015. Now the first such Suvidha Train is being started from 13th July, 2015 between Gorakhpur and Anand Vihar (Delhi). The booking for this train has started today i.e. 08-07-2015. This train will run from13th July to 30th July 2015. The train number 05027 Gorakhpur-Anand Vihar biweekly Suvidha special train will start every Monday and Wednesday (13,15, 20, 22, 27, 29 July 2015) from Gorakhpur at 20:55 hrs and will reach Anand Vihar next day at 11:00 hrs. it will have stops at Khalilabad, Basti, Gonda, Lucknow, Muradabad. In the other direction, the train number 05028 Anand Vihar biweekly Suvidha special train will depart every Tuesday and Thursday (14, 16, 21, 23, 28, 30 july, 2015) at 14:00 hrs and will reach Gorakhpur next day at 05:10 hrs. it will have same stops. Suvidha types of trains are planned to be run during peak summer, winter rush seasons, festivals and on other occasions as jointly decided by COMs and CCMs of the zonal Railways. Only confirmed and RAC tickets will be issued on these trains. Advance Reservation Period (ARP) of the train will be maximum 30 days and minimum 10 days. Tickets for the train will be available both at Railway Reservation Counters and e-ticket through IRCTC. Passenger has to produce one of the prescribed Identity Card during journey for verification purpose. No concession, no free/complimentary pass will be applicable and also for children full adult fare shall be charged. Minimum fare of Suvidha train shall be Tatkal fare for the class. Fares would increase after booking of every 20% of seats/berths subject to maximum three times of Tatkal fare. Other applicable supplementary charges like reservation charge, superfast charge, service tax etc. shall be levied separately. 50% refund of fare shall be granted upto 6 hours before the scheduled departure of the train or preparation of the chart whichever is earlier. After that no refund shall be permissible. In normal circumstances cancellation of Suvidha train is not permitted However, In case of cancellation of train in exceptional circumstances, full refund of fare shall be granted for counter PRS ticket across the counter and for e-tickets full refunds of fare shall be directly credited to the customers account. For any other reason, if berth cannot be given to passenger by Indian Railways, full refund shall be granted to the passenger manually. The Suvidha trains are planned to be notified on 7th July 2015. The Ministry of Road Transport & Highways has started the initiative of promoting vehicles which are fueled with clean fuels like Bio-Ethanol, Bio-CNG, Bio-Diesel, Electric Batteries, etc. The specifications for test reference fuel for Bio-Ethanol fuel vehicles, emission for Bio-Ethanol Fuel Vehicles, were earlier notified by the Ministry. Now, the Ministry has notified norms for the use of Bio-CNG for testing and exhaust emission for vehicles running on Bio-CNG and the related norms. With this notification, the vehicle manufacturers can manufacture, sell and get the vehicles fueled by Bio-CNG in the country. A meeting to review the performance of 7 National Institutes under the Department of Empowerment of Persons with Disabilities and 8 Composite Regional Centres (CRCs) under these National Institutes was chaired by Minister, SJ&E, Shri Thaawar Chand Gehlot in the presence of Minister of State for Social Justice & Empowerment, Shri Krishan Pal Gurjar and Secretary, Department of Empowerment of Persons with Disabilities, Shri Lov Verma here today. The Minister while addressing the meeting stated that taking a cue from the Prime Minister's Digital India Programme, there is an urgent need to provide a Universal ID should be provided to every Person with Disability in the country and tie-ups should be encouraged with scientific institutions to help in the area of education, skill training and specialized services. All the National Institutes under the Department for the first time achieved a target of providing rehabilitation services to more than 10 lakh beneficiaries. A decision was taken to provide modern services in collaboration with even international agencies so that in the rehabilitation centre, aids and assistive devices of superior technology are provided to persons with disabilities. New buildings for CRCs are being started in the current year in Patna, Srinagar, Ahmedabad, Bhopal, Kozhikode, Guwahati and Lucknow. PDUIPH, New Delhi has for the first time started kits for Leprosy Cured persons and NIMH, Secunderabad has started kits for Mentally Impaired children and students. The Minister instructed that grading of National Institutes be carried out to set targets and assess their performance and it should be ensured that the grading should include extent of benefits of skill development and training of youth given. Shri Thaawar Chand Gehlot, Union Minister for Social Justice & Empowerment, felicitated Ms. Ira Singhal, All India No.1 rank holder in the Civil Services Examination, 2014, in the presence of Shri Lov Verma, Secretary, Department of Empowerment of Persons with Disabilities and other senior officers/officials of the Ministry here today. Secretary, Department of Empowerment of Persons with Disabilities Shri Lov Verma assured her that the problems pointed out by her which are being faced by Persons with Disabilities (PwDs) while appearing in competitive examinations, shall be addressed and the Department will proactively ensure that seamless guidelines are available for PwDs. Joint Secretary, Department of Empowerment of Persons with Disabilities Shri Awanish K. Awasthi informed that in consultation with UPSC, SSC, UGC and other educational bodies, the Department will strive to ensure that the guidelines are such that they help and promote the cause of PwDs to achieve their inclusion, participation and empowerment.